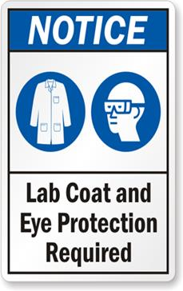 Applicants shall wear laboratory coat and safety goggle provided by Assessment Agency before entering the laboratory. Assessor has the right to restrict applicant to enter the laboratory if any discrepancy is found. Do not place flammable solvents in ovens. Do not use an open flame in the vicinity of any flammable solvent. Do not pour flammable liquids into the sink or drainage system. Observe the Laboratory’s fire orders and follow the instructions in case of a fire. Inspect gas tubing regularly and replace any that shows cracks. In the event of an electrical fire, switch off the mains supply; do not use water or water-based extinguishers to put out the fire. Before leaving work areas, make thorough checks on windows, instruments, lighting, water, gas and electricity supplies. Switch off the gas main. Wear safety glasses in work area and wear other protective equipment whenever necessary. Wearing of contact lenses without eye protection in work area is strictly prohibited. Cover all open wounds when handling chemicals. Wash hands after work and before leaving the Laboratory; use disinfectants and detergents after handling suspected infectious exhibits. Do not pipette by mouth. Restrict the application of mouth-operated equipment. Do not carry a bottle by its neck; use a bottle carrier. Do not run, prank or play in the Laboratory. Do not wear sandals, slippers or high-heel shoes. Do not eat or drink in work areas in the Laboratory. Do not work alone in the Laboratory. Wear laboratory gown and button it up in analytical work area and Dangerous Goods Store. Empty laboratory gown pockets before sending it for laundry. Avoid using not well established analytical methods outside normal working hours. Do not wear protective gloves in non-analytical work area to avoid contaminating public facilities such as water taps, telephone handsets and door handles with the tainted gloves. Report any unsafe conditions immediately to the instructor/technician. Do not smoke, apply make-up, consume food or beverages in laboratories. Never store food or drink in laboratory refrigerators. Know the exits in the Laboratory and keep their access clear of obstruction. Keep floor tidy and dry. Keep benches clean and free from chemicals and apparatus which are not immediately required. Keep aisles free from obstruction. Maintain water level in hot water baths. Label all containers in use. Rinse all apparatus containing harmful chemicals before leaving them for final cleaning. Store the washings in appropriate chemical waste containers. Put broken glassware in “BROKEN GLASS” area. Clean work area and equipment thoroughly after use. Display warning signs in the fume cupboard when working with highly reactive chemicals, flammable solvents etc. Pay attention to dust hazards when working with large quantities of light powders and when carrying out weighing, grinding or sieving operations. Do not point boiling tubes towards other people or yourself. Do not climb on stools. Do not leave experiments unattended. Do not place closed containers near heat source. Keep the interior of fume cupboards and nearby areas clean and clear. Keep fume cupboard sash closed or in the lowest position whenever possible. Carry out the work in a fume cupboard if the sample is likely to give off toxic or obnoxious vapour. Do not place objects near the sash of a fume cupboard. Display appropriate warning signs, such as corrosive or flammable, to indicate the nature of work being carried out in the fume cupboard. Wear gloves, safety glasses/face shield, respirator and other protective gear where appropriate. Handle toxic, flammable, or fuming chemicals in a fume cupboard.